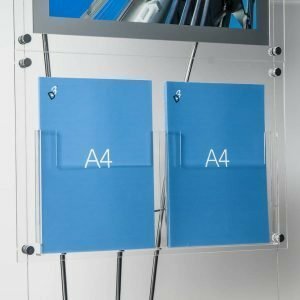 Clear acrylic A4, A5 and DL leaflet holders are attached to tension cables to create stylish leaflet display stands. The brochure holders are modular and can be attached in a variety of configurations. This means you can vary the quantity and sizes of literature displayed on a single stand. 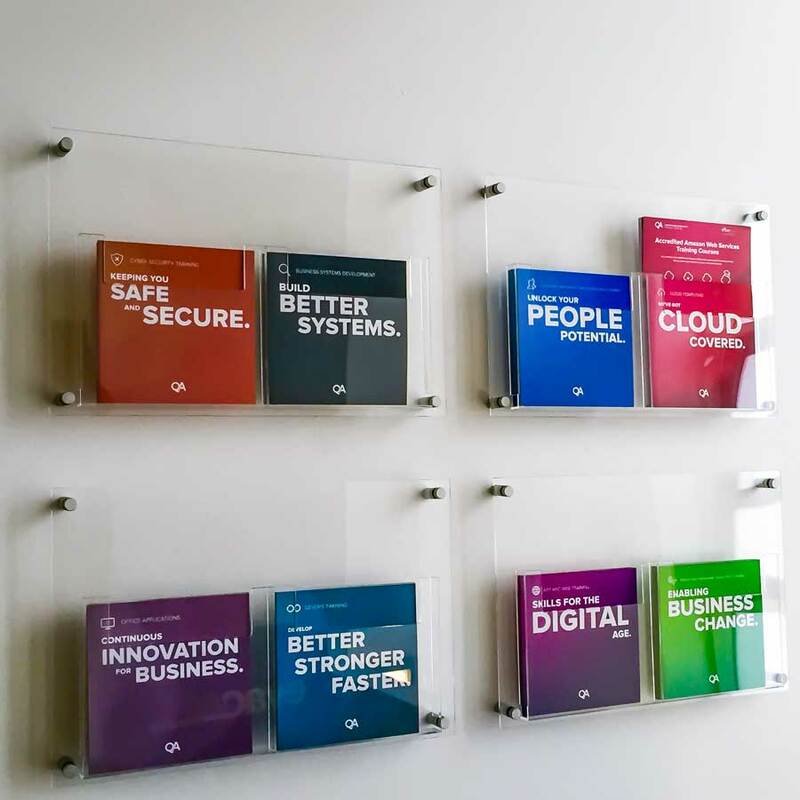 Customise your literature stand by adding a printed graphic panel to the system. 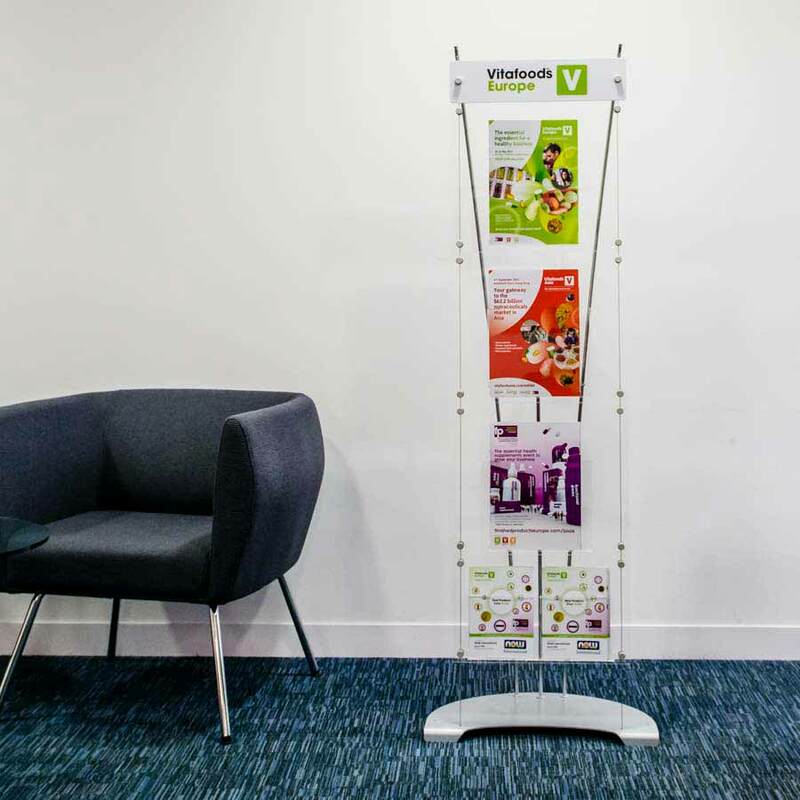 This leaflet display stand is ideal for interior display in marketing suites, reception areas and corporate offices. They can also be used for exhibitions and trade shows. 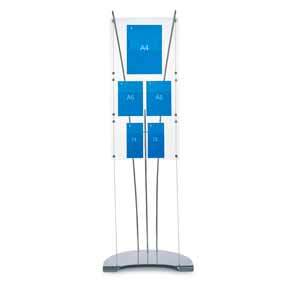 Display stands are free standing therefore they be placed anywhere. Designed to display catalogues, brochures and other promotional literature. The leaflet holders are made from 3mm clear perspex acrylic. The 20mm deep acrylic pockets are fixed to tension cables with large easy to use fixings. These are clamped to tension cables so the acrylic holders float in mid air. 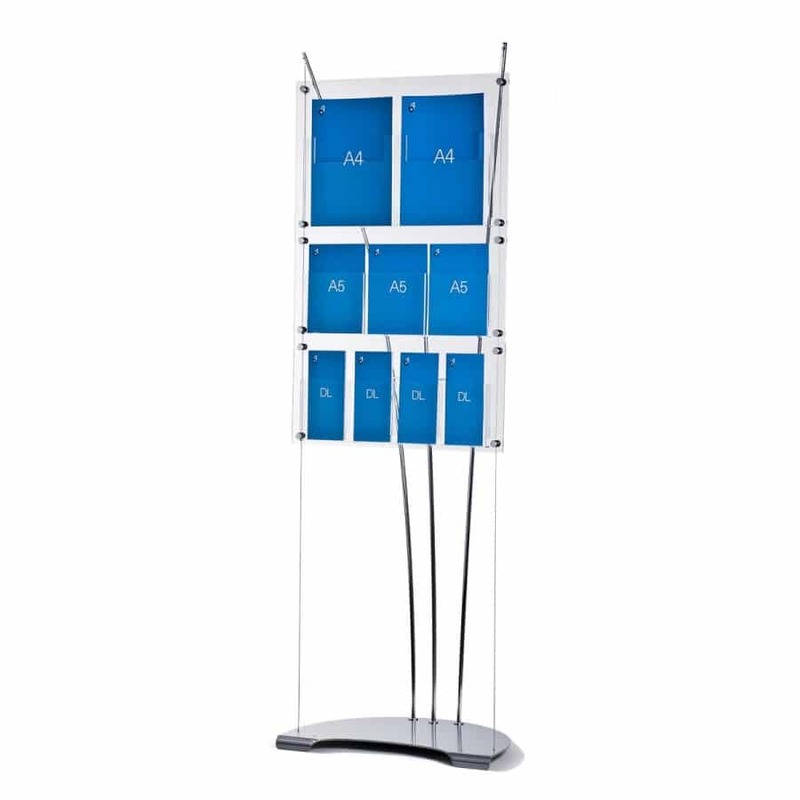 A maximum of three rows A4 double units can be attached to the literature display stands. Up to four rows of A5 and DL literature holders can be attached. Brand your brochure holder with a custom printed graphic. We apply a graphic to an aluminium panel which is then sealed for protection. Send us your logo and we’ll create the header artwork free of charge or you can download a guide at the bottom of this page. We can supply larger headers if required. Please get in touch for prices and lead times. 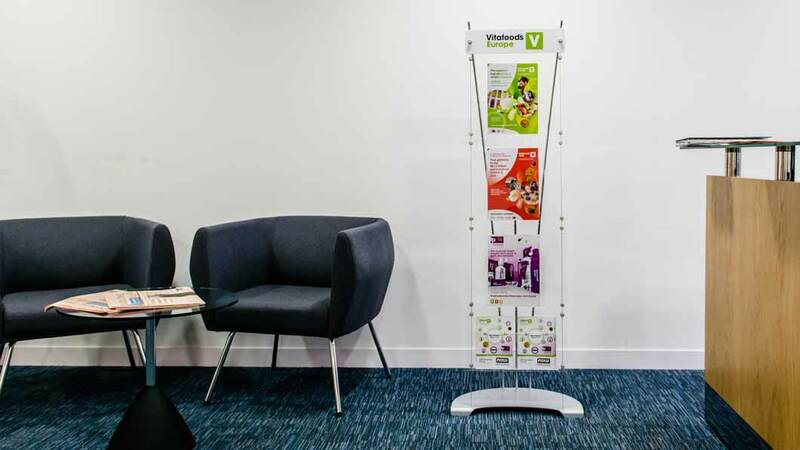 The same modular A4, A5 and DL leaflet holders can also be used as wall mounted leaflet displays if you want a consistent look throughout your interior space. All wall mounted leaflet holders are supplied with aluminium stand off fixings that match the fixing used on the leaflet stands. Purchase additional leaflet holders here if you want to add an a second row. D3 leaflet display stands are self-assembly display. A key feature is the ability to display different sizes of leaflets on the same display. 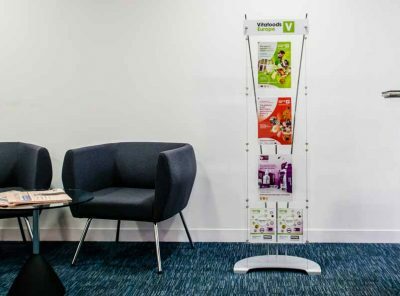 Floor standing leaflet display stands are available in two width options – 415mm or 540mm. The same frame components are used to make each display. You vary the width by fixing the cables to different positions on the baseplate. Central mast and brace stiffen the system and stop it wobbling if it gets accidentally knocked. 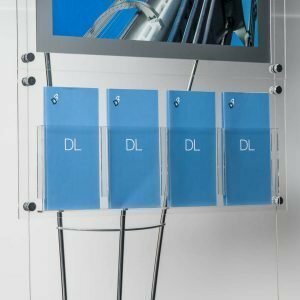 Select A4, A5 & DL clear acrylic brochure pockets to attach to your display. Overall height of all D3 Leaflet Stands stands is 165cm. Displays weigh from 7kg – 11kg depending on model. The 4.5kg steel base makes the display very stable but the stands still be picked up by the masts and moved around when fully assembled. Perfect for corporate, reception, museum and retail environments. Literature dispensers are a great choice for displaying your marketing & advertising leaflets. 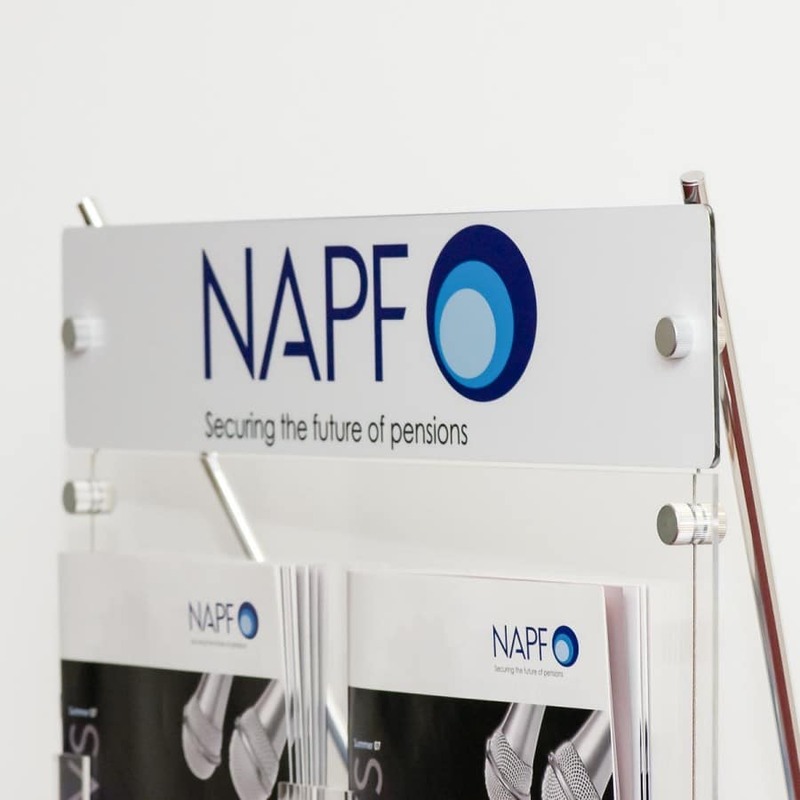 Use perspex leaflet holders to encourage interest in your services, products and offers. Locate your brochure stand in a high traffic area to kick off a special offer or new promotion. 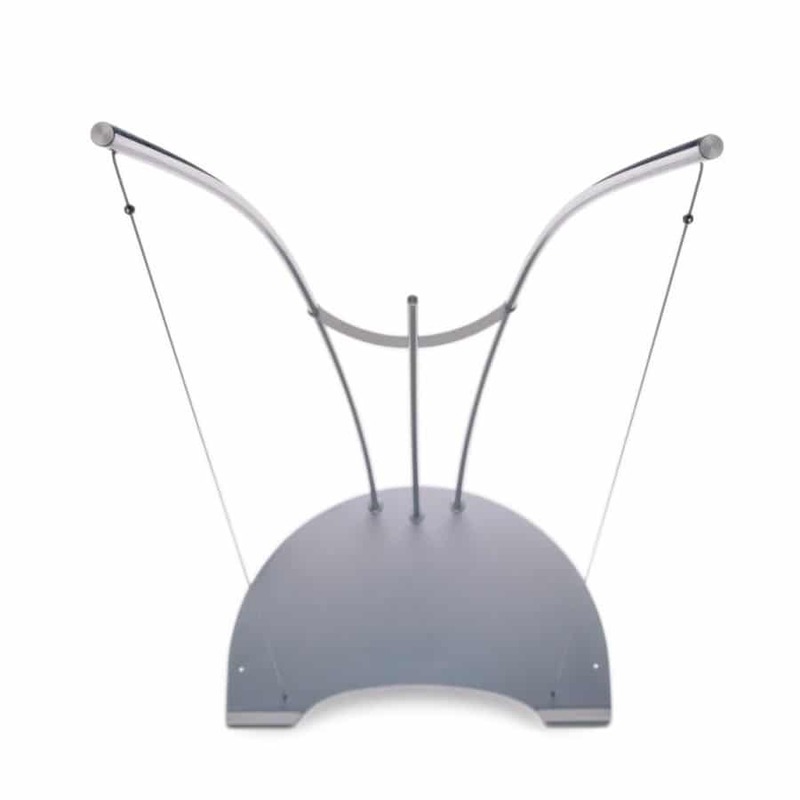 Literature stands provide an stylish display solution for public areas. 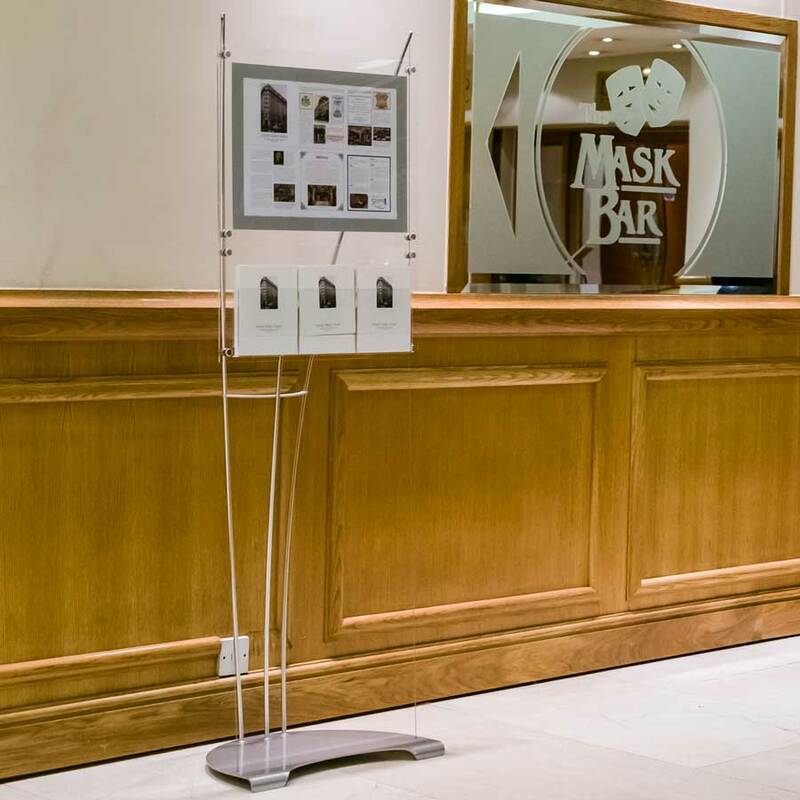 Displays for receptions areas, marketing suites, showrooms & exhibitions stands. Q. Can I mix narrow and wide literature racks on the same display? No. The cable spacing is different for each width and this means you can’t mix them. 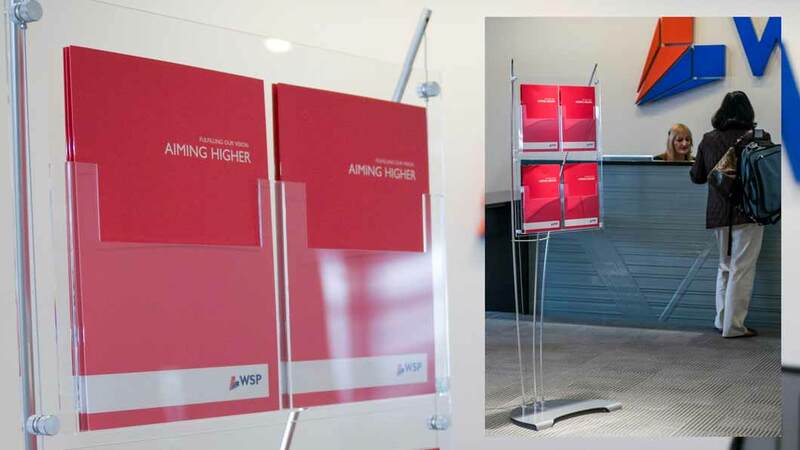 Q.Can the perspex leaflet holders be used in conjunction with your poster holders? 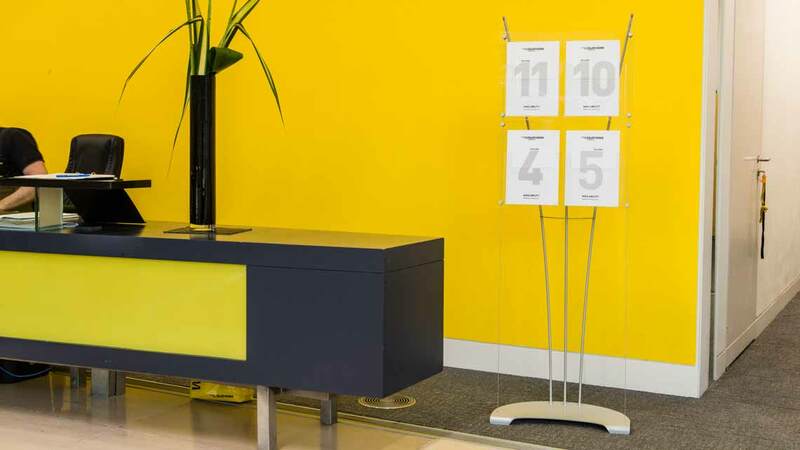 Yes, the poster and leaflet holders were developed as part of our modular D3 Display system. The most popular poster holder size is A3. 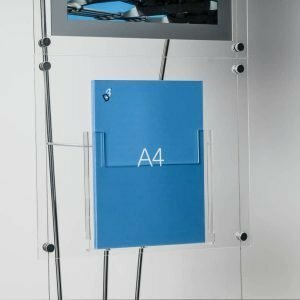 In landscape format, this can be combined with the A4 Double, A5 Triple and DL Quad brochure holders. In portrait format, this can be combined with the A4 Single, A5 Double and DL Double brochure holders. Call us and we can tell you if the combination you want is possible, and create a visual for you. Q. 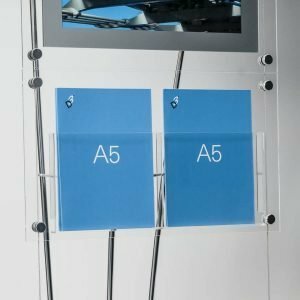 Can you remove scratches from perspex display stands? Use a soft cloth or rag and rub Brasso in a circular motion along the scratch. Leave to dry and polish. Repeat if necessary. We’ve had success using this method to remove scratches. The acrylic won’t be as clear as it was at first, but the scratch should disappear unless it’s really deep. Q. 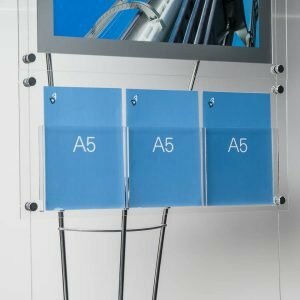 What is the best way to clean my brochure display? Use a soft cloth or rag and glass cleaner or methylated spirits. Q. 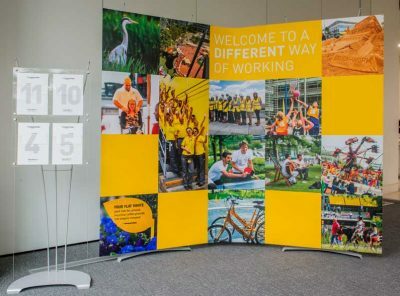 How long does it take to print the graphic headers for the brochure displays? Allow 4 – 5 working days from receipt of artwork to dispatch. Q. I’m a specifier, can I buy the systems at a trade price? Depending on the quantity required, displays will usually be dispatched within 1 – 2 days. Q. 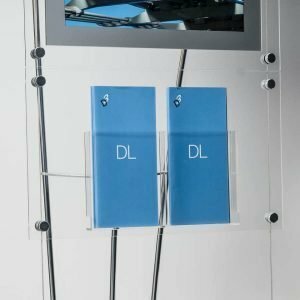 Do you stock any other sizes of Leaflet Dispensers other than A4, A5 and DL? No. Other sizes would have to be made as specials. This can be done but it takes about 2 -3 weeks and is expensive. Q. 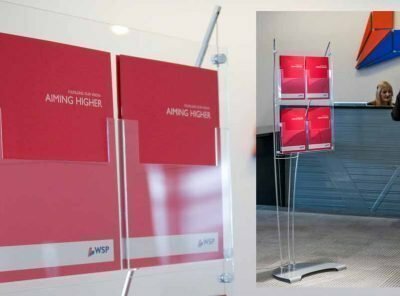 Can we hire a Perspex Display Stands from Dimensions? 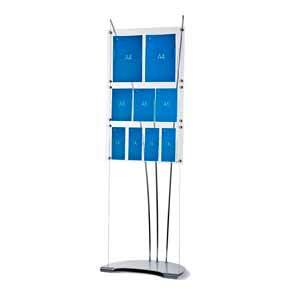 Q. I’ve lost my leaflet display stand assembly instructions where can I get replacements? Q. 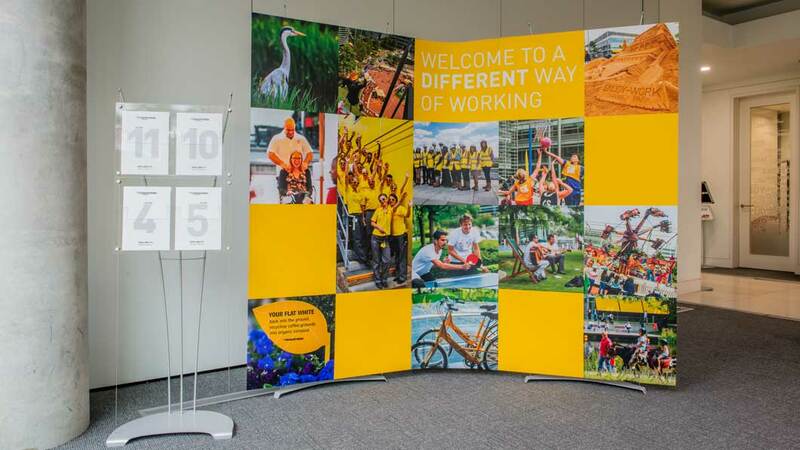 How quickly can a D3 brochure display be assembled? Allow 10 minutes for assembly. Q. Can I put more than three rows of acrylics on a brochure display stand? Yes, as long as it’s NOT all A4 units as the overall weight becomes too heavy.